"examples that suggest history is repeating itself"
No tópico da autenticidade, hoje sobre imprensa, e, necessariamente, onde chocam. Fake news is but one symptom of that shift back to historical norms, and recent hyperventilating mimics reactions from eras past. The internet allows that appetite to be fed a bottomless supply of semantic junk [mas] we have always been "post-truth". The appetite for populism is not a new problem. In the ferocious newspaper battles of 1890s New York, the emerging sensational style of journalism in Joseph Pulitzer’s New York World and William Randolph Hearst’s New York Journal was dubbed "yellow journalism" by those concerned with maintaining standards, adherence to accuracy and an informed public debate. We now have the same problem with online misinformation. These problems, however, are hardly new but they are greatly amplified by modern technology. The earliest forms of modern newspapers, which appeared in 19th century Europe and America, were affiliated with political parties. They were mouthpieces for party leaders to speak to their followers. The papers were mandatory for party members. News reporting was not important. Most of the articles were one-sided opinion pieces. Pulitzer, whose name today is associated with high-quality journalism, in his time was a sensationalist newsmonger. These news tycoons [ver Benjamin Day, James Gordon Bennett...] competed fiercely for public attention. They paid large sums to tipsters to get the raciest stories with little attention given to fact-checking. Fakes and embellishments were the rule of the day. Editors were under constant pressure to create excitement to help sales. They didn’t have to worry about credibility since the papers were not on a subscription model and there was no reader loyalty. The publishers who ignored the business side didn’t thrive or survive for long. This might seem obvious, but the opposite was also true: Companies that only or mostly cared about business didn’t thrive either. The organizations that went on to become multibillion-dollar juggernauts built great businesses AND had values that went beyond just business. The New York Times is a great example. At the start of World War II, the Times was locked in a fierce battle with the Herald Tribune to be the No. 1 paper in New York and the U.S. One reason the Times beat the Trib was because it was a better business. The Times gained a big advantage by publishing listings of all the garment merchants visiting New York City to do business. And its editors put these commercial listings on the paper’s front-page (! ), ensuring that everyone in the industry needed to buy the Times and advertise with the Times. But the Times also won because it didn’t sacrifice its editorial values and mission in pursuit of short-term profits. As World War II progressed, newsprint was rationed. There was less room in both papers, and both papers had to choose what to leave out. The Trib chose to print all the ads and cut back on news, while the Times cut back on ads to maintain its full news coverage. The Times faced angry objections and threats from its advertisers but it didn’t yield. Instead, it provided maximum coverage of the war, and took a financial hit for several years. After the war, the Times emerged as the unparalleled paper with more subscribers, more advertising revenue, and became, by many measures, the leading newspaper in the world. "I will add," Jefferson continued in 1807, "that the man who never looks into a newspaper is better informed than he who reads them; inasmuch as he who knows nothing is nearer to truth than he whose mind is filled with falsehoods & errors." The existence of an independent, powerful, widely respected news media establishment is an historical anomaly. (...) Prior to the twentieth century, such an institution had never existed in American history. America’s [has a] very long tradition of news-related hoaxes. (...) These historic purveyors of fake news were by no means obscure publications from the 19th-century equivalent of the digital gutter. (...) Even as the late-19th and early-20th centuries saw the early stages of the shift toward a more professionalized media, corruption of the information that reached readers remained common. Thomas Jefferson condemning fake news: "It is a melancholy truth, that a suppression of the press could not more compleatly [sic] deprive the nation of its benefits, than is done by its abandoned prostitution to falsehood," the sitting president wrote. "Nothing can now be believed which is seen in a newspaper. Truth itself becomes suspicious by being put into that polluted vehicle." Take Jefferson’s generation: our country’s earliest political combat played out in the pages of competing partisan publications often subsidized by government printing contracts and typically unbothered by reporting as we know it. Innuendo and character assassination were standard, and it was difficult to discern content solely meant to deceive from political bomb-throwing that served deception as a side dish. Then, like now, the greybeards grumbled about how the media actually inhibited the fact-based debate it was supposed to lead. [Alexis de Tocqueville, "Democracy in America":] assailed the day’s content producers as men "with a scanty education and a vulgar turn of mind" who played on readers’ passions. "What [citizens] seek in a newspaper is a knowledge of facts," de Tocqueville wrote, "and it is only by altering or distorting those facts that a journalist can contribute to the support of his own views." His concerns weren’t for passive failures of journalism, but active manipulation of the truth for political ends. Estamos conversados sobre a qualidade do jornalismo à data. Voltemos então ao seu momento de profissionalização, aquilo dos ads ie $$$, com uma pequena indicação de como sobreviver à calamidade de notícias falsas em intro, então como agora. Proliferation of multiple titles in each major city provided a menu of worldviews that’s similar to today. The infant republic nevertheless managed to survive the fake news scourge of early 19th-century newspapermen. "The large number of news outlets, the heterogeneity of the coverage, the low public esteem toward the press, and the obvious partisan leanings of publishers limited the power of the press to be influential" (...) Public backlash was muted in part because of the lack of widely accepted standards for the content appearing in readers’ news feeds, not unlike today. Objective journalism had yet to settle in, and there were no clear dividing lines between reporting, opinions, and nonsense. Then came another newsman – Adolph S. Ochs, publisher of The New York Times: he believed that the high-income elite would always need good-quality information. And if you built a loyal community with these customers, advertisers would pay a premium to reach them. Ochs told his colleagues: "Decency means dollars." This subscription model set forth new conditions in which a newspaper’s business was aligned with the long-term loyalty of its readers. Daily circulation was no longer the king – instead, image and reputation was. Ochs’ brilliance was his understanding that the news business was a trust business. Errors needed to be corrected in the following day’s paper. Facts needed to be double checked and properly sourced. Opposing views had to be included and uncertainty acknowledged. Falaremos outro dia de "imagem e reputação" a propósito de poseurs. Ochs’ brand model prospered until the arrival of the internet age, which has fundamentally changed the way news is consumed. Advertising-centric business models (...) required much larger audiences than highbrow partisan opinions would attract. So the motivation to mislead shifted slightly more toward commercially minded sensationalism. - aliado ao seu sempre presente -uh- alidado: o gatekeeper. Commercial monopolies, coupled with lack of political partisanship, gave news organizations daylight to professionalize and police themselves. For 500 years after Gutenberg, the dominant form of information was the printed page: knowledge was primarily delivered in a fixed format, one that encouraged readers to believe in stable and settled truths. In the era of the printing press, words on a page nailed things down, whether they turned out to be true or not. The information felt like the truth, at least until the next day brought another update or a correction, and we all shared a common set of facts. This settled "truth" was usually handed down from above: an established truth, often fixed in place by an establishment. This arrangement was not without flaws: too much of the press often exhibited a bias towards the status quo and a deference to authority, and it was prohibitively difficult for ordinary people to challenge the power of the press. Didn’t ‘filter bubbles’ exist before the algorithm? The fascination for the power of algorithms to "shape our realities" casts a shadow on the fact that there was never a "golden age" when politics and media were dominated just by "truth" and "facts". The broader issue driving the paranoia is the tardy realization among mainstream media that they no longer hold the sole power to shape and drive the news agenda. Broadsides against fake news amount to a rearguard action from an industry fending off competitors who don’t play by the same rules, or maybe don’t even know they exist. In the same way as the "Arab Spring" events were met with enthusiastic reactions about the "power of social media" to turn the world into a democratic wonderland, political events of 2016 have led to the widespread consensus that "the Internet did not generate the community of informed people we expected but fragmentation of opinions in isolated bubbles". The internet is still filled with poorly designed ads (...) Attention has shifted to the web, but the ad industry still treats it as second rate (...) This creates a drain on the entire system by weakening the economics of digital content, making it even harder to support quality journalism and compelling entertainment. In fact, the ad industry’s slowness to shift to digital is at the root of the problems faced by news and entertainment. Social platforms can only optimize the content uploaded to their services, and when there isn't a solid business model for content, the void is filled with fake news, cheap entertainment, and deceptive ads. "Whatever its other cultural and social merits, our digital ecosystem seems to have evolved into a near-perfect environment for fake news to thrive"
This does not mean that there are no truths. It simply means, as this year has made very clear, that we cannot agree on what those truths are, and when there is no consensus about the truth and no way to achieve it, chaos soon follows. Algorithms such as the one that powers Facebook’s news feed are designed to give us more of what they think we want – which means that the version of the world we encounter every day in our own personal stream has been invisibly curated to reinforce our pre-existing beliefs. (...) Google’s personalised search function: no two people’s Google searches are the same – means that we are less likely to be exposed to information that challenges us or broadens our worldview, and less likely to encounter facts that disprove false information that others have shared. We’re getting countries where one half just doesn’t know anything at all about the other. The levelling of the information landscape has unleashed new torrents of racism and sexism and new means of shaming and harassment, suggesting a world in which the loudest and crudest arguments will prevail (...) revealing that the inequalities of the physical world are reproduced all too easily in online spaces. Digital, bad. Jornalismo, a salvação. 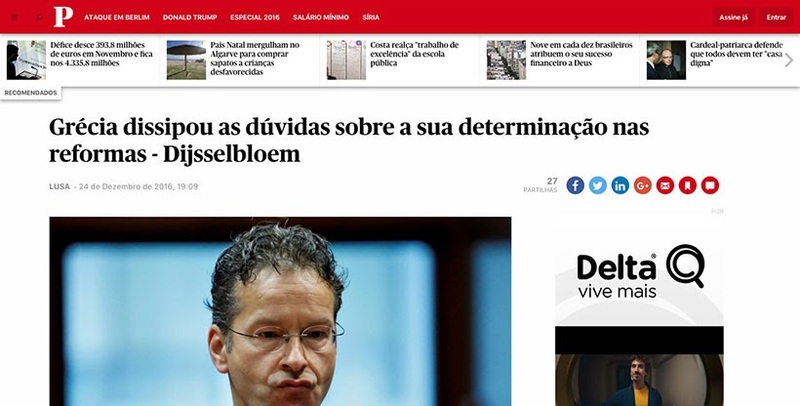 Apesar de sabermos que antes do digital já o jornalismo o era mau. Entra o dollar bill e tudo é bom obviamente, mas agora está tudo mau de novo. The rise of Trump "is actually a symptom of the mass media’s growing weakness, especially in controlling the limits of what it is acceptable to say". "For decades, journalists at major media organisations acted as gatekeepers who passed judgment on what ideas could be publicly discussed, and what was considered too radical"
The weakening of these gatekeepers is both positive and negative; there are opportunities and there are dangers.(...) the old gatekeepers were also capable of great harm, and they were often imperious in refusing space to arguments they deemed outside the mainstream political consensus. In 1928, when William Paley left his family cigar business to build CBS radio, the conventional wisdom was that radio would never be a big business. (...) It wasn’t thought to be possible for a real journalist to work in any medium other than print. Again and again, the conventional wisdom was dismissive of every new medium; each new communications technology was seen as a fad, a tool for demagoguery, or the end of journalism. And always these skeptics were proven wrong, usually by newbies who didn’t care about the old way things were done. Today we see a similar phenomena happen again and again. The media industry establishment initially dismisses, and then embraces, the new communication technologies the internet has given us: blogging, Twitter, social, mobile, web video. And the people who pioneer the new formats, do the most innovative and creative work, and who bring the rest of the public from skepticism to enthusiasm, are mostly the ones who don’t care what the establishment thinks, who come to the industry with a fresh mind without anything to unlearn, and who have a broadly optimistic disposition toward new communications technology. The big breakthrough for BuzzFeed also came after our early clipping service days when smartphones became social and could display vivid pictures and video for the first time. Suddenly our lists, quizzes, and videos could be seen and shared by an audience of billions of connected readers right from their phones. Social and mobile converged, becoming the primary form of distribution for our content. The leverage provided by this massive reach is why we can make aggressive investments in journalism and entertainment. (We are still in the midst of this shift, with mobile, social, and global distribution accelerating faster than ever). Of course, there are limits to these historical comparisons. These days, media companies don’t have natural monopolies or oligopolies (...) There is more competition, the market is more fragmented, and gatekeepers have less power. Advertisers have more ways to reach consumers so they aren’t as dependent on publishers and can negotiate lower rates. Ie, e imaginem-nos a esfregar as mãos malevolamente ao som de um ainda mais malicioso"perrrrrrrfect!" arrastado enquanto contemplamos a tempestade perfeita que nos abriu a oportunidade de os lutar em condições iguais. News is increasingly read in social media as a one-off item. Each story must sell itself and be heard over the others. Instead of relying on one or two media outlets, readers are presented with a constant flow of stories from all sides. This weakens the trust between news providers and readers. Today most readers are not loyal subscribers – they are fly-bys. (...) Many media outlets admitted that most of their readers were in this category. The conversion rate of turning them into loyal subscribers was below single digit. And for the young generation, the majority won’t even go to news sites directly. "Our news ecosystem has changed more dramatically in the past five years than perhaps at any time in the past 500." The future of publishing is being put into the "hands of the few, who now control the destiny of the many". News publishers have lost control over the distribution of their journalism, which for many readers is now "filtered through algorithms and platforms which are opaque and unpredictable". This means that social media companies have become overwhelmingly powerful in determining what we read – and enormously profitable from the monetisation of other people’s work. "There is a far greater concentration of power in this respect than there has ever been in the past." The old idea of a wide-open web – where hyperlinks from site to site created a non-hierarchical and decentralised network of information – has been largely supplanted by platforms designed to maximise your time within their walls, some of which (such as Instagram and Snapchat) do not allow outward links at all. (...) young people, who are most likely to have faced harassment online, are seeking more carefully protected social spaces. But the closed space of a chat app is an even more restrictive silo than the walled garden of Facebook or other social networks. The diversity that the world wide web had originally envisioned has given way to the centralisation of information inside a select few social networks – and the end result is making us all less powerful in relation to government and corporations. [Facebook] nor does it dictate what news organisations produce. But when one platform becomes the dominant source for accessing information, news organisations will often tailor their own work to the demands of this new medium. (...) In the last few years, many news organisations have steered themselves away from public-interest journalism and toward junk-food news (...) the new measure of value for too many news organisations is virality rather than truth or quality. Só recordando: "it would be a mistake to think this is a new phenomenon of the digital age". Information manipulation – in all forms and for all purposes – thrives under such conditions. As page-views become the key metric to measuring success, the focus has now shifted towards how to "game" the system. Exaggerated headlines, fanciful but irrelevant clickbait and provocative statements not backed up by facts – all the "black magic" of the yellow press age – are making a comeback with a vengeance. The media industry is painfully searching for a new business model. Many media companies are turning to technology and data science for help, trying to better understand readers’ behaviour. Hopefully, somebody will come up with a new "Ochs moment" – his epiphany more than a century ago is still relevant: at its heart, the news business is a trust business. These kinds of digital, ethical problems represent a defining challenge of the 21st century. They include breaches of privacy, of security and safety, of ownership and intellectual property rights, of trust, of fundamental human rights, as well as the possibility of exploitation, discrimination, inequality, manipulation, propaganda, populism, racism, violence and hate speech. We are in the midst of a fundamental change in the values of journalism – a consumerist shift. [Torna-se necessário] strengthening social bonds, or creating an informed public, or the idea of news as a civic good, a democratic necessity. I believe that a strong journalistic culture is worth fighting for (...) [To have an] active public that scrutinises the powerful, not an ill-informed, reactionary gang that attacks the vulnerable. (...) The challenge for journalism today is not simply technological innovation or the creation of new business models. It is to establish what role journalistic organisations still play in a public discourse that has become impossibly fragmented and radically destabilised. The shift from print to digital media was never just about technology. Technology and media do not exist in isolation – they help shape society, just as they are shaped by it in turn. That means engaging with people as civic actors, citizens, equals. It is about holding power to account, fighting for a public space, and taking responsibility for creating the kind of world we want to live in. Huge shifts that are happening in the tech and media industries: the public was informed by social media platforms filled with user-generated content, fake news, low-cost and sensationalistic aggregators running sketchy ad arbitrage schemes, partisan hacks and political actors, and the opinions of poorly informed celebrities, internet trolls, and candidates themselves going "direct to consumer" with misleading information and unchecked lies. (...) The problem isn’t just affecting news. The entertainment industry has also been too slow to shift to digital, resulting in a lack of compelling storytelling on digital platforms. The vast majority of the budgets in the entertainment industry are focused on declining traditional platforms like linear television and cable [quando por outro lado se tornou possível e lugar comum que] creative people can connect more closely with massive audiences and where it is possible to directly serve more diverse audiences as well as for people to share media with those who matter in their lives. At a fundamental level, these problems are symptoms of a wider shift in the economics of the media industry. Print revenue is decelerating at a rapid pace, cable subscriptions and TV ratings are starting to decrease even for live sports, and traditional media businesses are at various stages of a terrifying decline. Audiences are moving to more innovative, modern platforms created by tech companies in California like Google, Facebook and Snap. Meanwhile, media companies have been much too slow to shift to digital; they’ve clung to print and broadcast, even when it was clear audiences are moving elsewhere (...) creating a void that is filled by the cheapest possible content. (...) The attention has moved, but the content-creation resources mostly haven’t. The future opportunities for the media industry are gigantic. The global scale of "social" and "mobile" is almost unimaginably vast (...) the content these people are consuming hasn’t yet reached the full potential of the medium. Articles and text often mimic print formats from decades ago [mas] our industry has a tremendous opportunity to invent the future of content on social and mobile platforms. We can pioneer new creative practices, new formats, and better experiences for audiences. And our work will be seen by the biggest addressable audience ever assembled. It will take decades for analog print and broadcast to decline, and TV will continue to be very profitable for many years, but in the long run, the internet will win. In the long run, the internet always wins. What we are doing has a strong precedent grounded in the history of newspapers, magazines, radio, and TV; and that exciting possibilities have been unlocked by the global internet, social networks, and smartphones that would make an earlier generation of media companies jealous. $$$ como o grande nivelador? Esperamos que não, a tech existe agora, esperemos que os punx não se queiram limitar ao zine agrafado apenas pela estética do mesmo e escolham os "fins", não os "meios".